Are you ready to update your bathroom or hope to improve your bath to appeal to potential buyers? Regardless of how small or big your bathroom may be, there’s a good chance you could use more storage in this, one of the busiest rooms of the house. Getting creative with bathroom storage is an excellent approach for adding both practical and stylish enhancements. How you use your wall space in your bathroom can give you more storage options than you may realize. Sure, you can put shelves next to the sink, or add a new cabinet, but have you thought about going into your bathroom walls? Working between wall studs to create recessed shelving will not only give you more storage space, but you’ll also retain the overall square footage of your bathroom. You can also expand your storage options by going where shelves aren’t typically found. Installing a recessed shelf in the shower will make for a perfect place to store shampoo and soap for every member of the family. Hanging sturdy shelves towards the top of walls will give you more space for extra linens, keeping them handy yet out of the way. Do you have a pedestal sink without any storage available underneath? Now you can purchase wrap-around cabinets for under your sink, adding some new shelves which are ready to use. If you prefer the open feel of the pedestal sink yet find it’s the best place to keep the trash can, adding a cloth skirt around the sink will give you the option to keep things discreetly stored while retaining the architectural style of your sink. Add more storage without a lot of remodeling with a simple solution involving towel racks and hanging baskets. Install some towel racks where you can hang a basket to store toiletries and accessories. Baskets and bins also make organizing your bathroom easier and can be stored in cabinets and on shelves to help keep things clean and tidy. Speaking of cabinets, if it’s time to replace yours consider pull-out shelves, these are excellent for maximizing your space while keeping it easy to access what you need. Do you have a false drawer in your vanity or a tub surround which is taking up unused space? Get behind these areas and add a tilt-out drawer or easy-open panel. Even if the added space isn’t much, having a discreet place to store cleaning supplies or personal items can make a big difference. 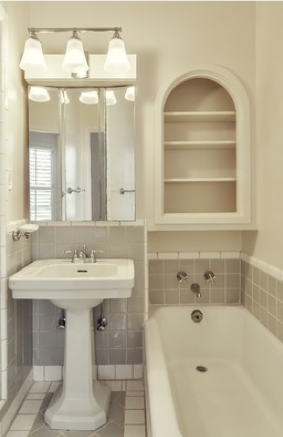 For more creative storage ideas in the bathroom, check out this article published by HouseLogic.com. When it’s time to sell or buy a home, choose a Realtor® who puts their expertise to work for you, so you can enjoy the process from start to finish. The Driscoll Properties Team is ready to help you every step of the way. Learn more at our website, DriscollProperty.com, then contact the Driscoll Properties Team at 847-533-6786 to help you discover the home of your dreams.